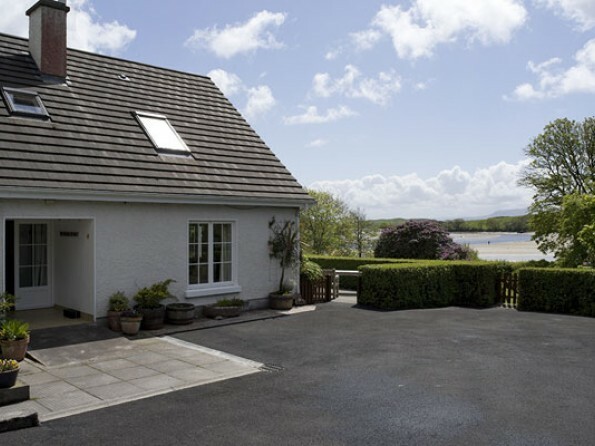 This spacious south facing house is located on the wild and unspoilt coast of Clew Bay with direct access to the tidal sandy seashore from the house through privately owned woodland. With endless activities nearby and a tennis court and games room on site, it’s the perfect base for a family or friends holiday. This spacious and comfortable self catering houses is suitable for families, couples, friends or a combination of these. The accommodation to the highest standard ensuring comfort combined with a relaxed and welcoming atmosphere. 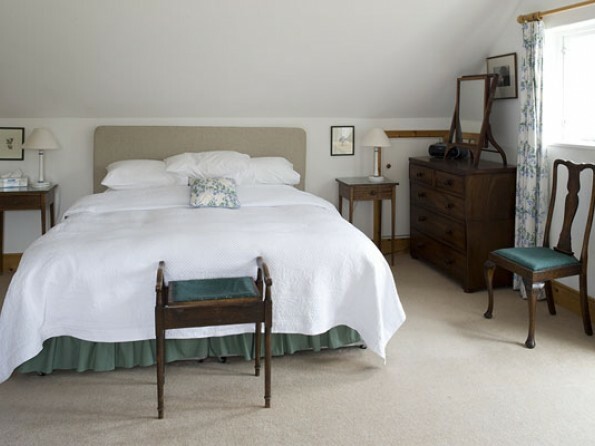 We encourage guests to treat the place like home and the house is full of books and pictures. There is private access to the seashore provided by paths which lead you directly from the house, through the woodland to the water’s edge. 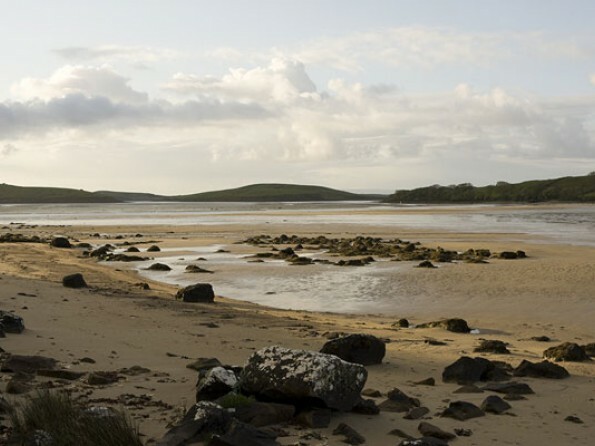 When the tide is out there is the option of walking out amongst the islands on the hard sandy foreshore. This can either be a short walk out and around the nearest island or a longer exploration as far as the nearby village of Mulranny. The house shares the tennis court and the games room with one other rental house. 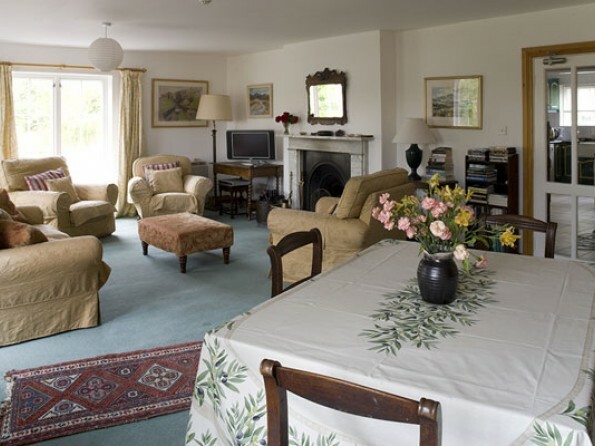 Both houses enjoy separate and private locations and can be rented separately or together. We are 60 km to the north of the beautiful wilderness of Connemara . 9 hole links seaside course in Mulranny (5 km) and an 18 hole Championship course in 260 acres of parkland in Westport (24 km). Spectacular seaside, beach and mountain walking including the chance to climb Croagh Patrick. Walking maps available. Rural and seaside routes from the house. Bicycles available for hire nearby. Horseriding available at nearby Carrowmore Stables. (5 minutes from Newport). Good choice of high quality river and lake fishing for salmon, seatrout and brown trout in nearby lakes. Permits & Ghillies by arrangement. Some of the best deep sea angling in Europe. Good shore fishing sites from nearby rocks and beaches. 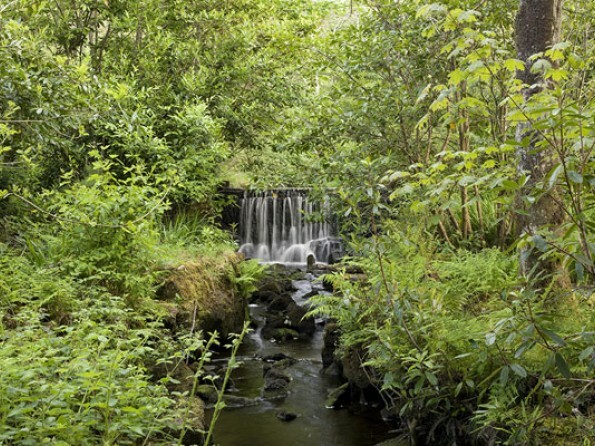 A wide variety of wildlife exists in the area and trips can be organised to watch for otters, spot birds and see wildflowers. Various health treatments are available in Westport by appointment. Airports: Knock (72km); Shannon (240 km); Dublin(280km). Ferries: Dun Laoghaire and North Wall, Dublin (280 km). Rosslare, Wexford (375 km); Cork (280 km). Trains: Dublin (Heuston) to Westport. Three Intercity services per day. Driving: Dublin to Castlebar on the N4, M4 and N5 and then the N59 to Newport. N5 and N59 from Knock Airport to Newport. Turn right in Newport and take the Achill / Mulranny road. 7 miles out you will pass Nevin's Pub. One mile further - you will have the sea on your left and the road will start to go through a wooded area. Slow down and turn left at the blue sign with ROSTURK WOODS on it. Follow the drive in and bear right keeping the tennis court to your left. Three upstairs double bedrooms - Large Master bedroom with south facing balcony (kingsize bed and single bed) and ensuite bathroom. South facing double bedroom with ensuite bathroom. Third double bedroom with single bed with ensuite shower room. Spacious south facing living room with open fireplace. Well equipped kitchen with dining area. Downstairs loo. 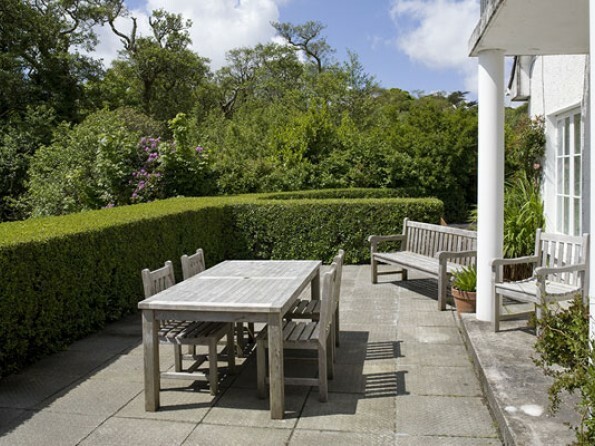 Large enclosed south facing terrace. BBQ available on request. Private location. Child and family friendly. 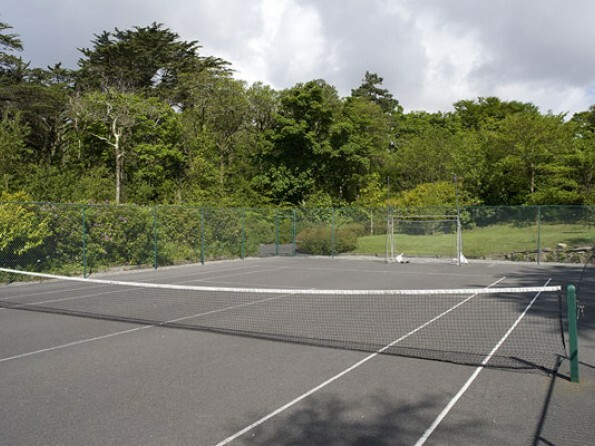 We can offer guests the use of a full size, hard surface tennis court at Rosturk Woods. 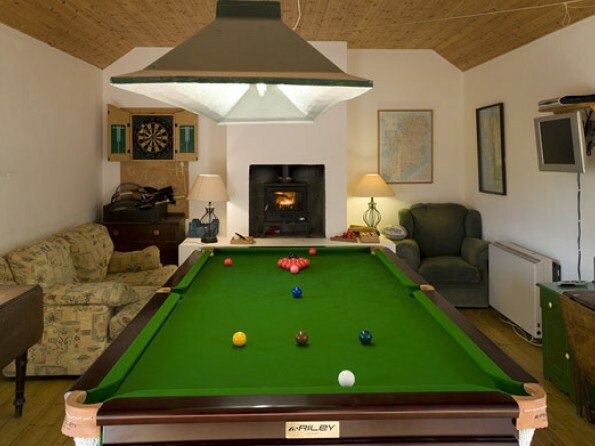 There is a games room with pool table and darts board which guests are welcome to use. With direct, private access to the water when the tide is in swimming is close by. 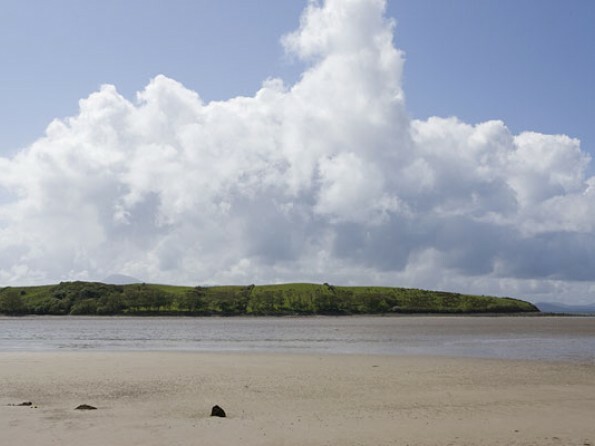 House located on coast of Clew Bay with its 365 islands. Wild and unspoilt. Fantastic beach and mountain walks on site and close by. Great for sailing and boating. Weather is changeable and stunning when the suns shines. Historic sites and museums in good driving distances. Interesting towns with good pubs and nice shops nearby. Stunning landscapes. Mulranny village has two supermarkets. Newport has a good supermarket with an off licence; an excellent butcher with prize winning sausages, black pudding and much more. Castlebar (17 miles) hosts the supermarket giants of Tesco’s, Dunne's Stores and Aldi. From Achill to Galway there are a wide variety of local craft shops. A wide selection of areas, sites and buildings of historical, scientific and archeological interest exist in the surrounding area from the Megalithic remains on Slievemore in Achill to the new visitors centre at the Céide Fields in North Mayo which show how the 5,000 year old settlement was found and how people lived at the time. Other places of interest include the Foxford Woollen Mills Visitor Centre which show how the mills came to be, founded in 1892 by a nun-mother Agnes Morrogh Bernard; the Deserted Village at Slievemore on Achill Island and the spectacular view from the Minaun Heights. Rental cost includes all bed linen and towels. The house is left ready for you to walk into with beds made etc. Grocery shopping for your arrival is offered by arrangement. Cleaning, laundry and babysitting available by arrangement. There is a departure cleaning cost that varies from 40 to 80 euros depending on the length of your stay. Your electrical and heating costs are meter read on arrival and departure and charged accordingly. Homecooked meals that are left in the house or deep freeze are available by arrangement. Menus available on line and special requests catered for. Cot and high chair available.